In the afternoon of the 5th of June 2015, I sat down by the waterside, exhausted by everything, completely empty and defeated. Then I looked up and saw the light, rippled in the water, and the tiny flowers brightly lit. Consider the lilies… I heard the words — Jesus’ words — spoken to me, comforting me. Earlier that week, I had received a dreadful shock. I had not slept for a couple of nights. I could no longer function and my boss told me to take the day off and do something that I really liked. So I went home, grabbed my camera and went to the botanical gardens, in hope of enjoying their beauty, finding rest and capturing that in some pictures. I wandered round, desperately trying to enjoy myself, and find some rest. I sat for an hour under a tree, just staring, letting my racing thoughts run their course, no longer trying to understand. I did not succeed in taking pictures. All the magnificent flowers looked really dull on my camera display. And I needed their beauty so much! I desperately wanted to capture anything beautiful, perhaps to affirm to myself that all was not lost, that there are still some good things too. I could not. I did not have the energy to find the right composition, to capture these flowers in such a way that did them justice. Then, when I finally realised that I was really very tired, and willing to admit to myself that I had lost, I sat down by the waterside. In front of me a field of grass with the most common little flowers that exist, just buttercups, nothing special. The scene greeted me: light, softly rippling water, and these little gems. My God was telling me that he was still there. Below the surface of all my failed good intentions, he was there. No need to fight so hard. No need to work so much. Just this: open your eyes and look at what God is doing. No, this is not the happy ending of a nice little story. It couldn’t be. It was the start of a much longer journey. But this moment surely was the foundation that kept me going during the very dark years that followed. 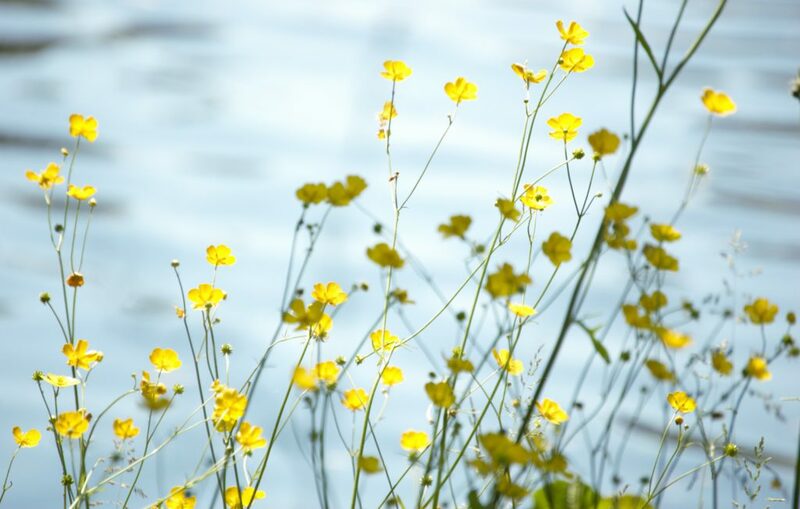 Opening my eyes did not only show me beautiful little buttercups, but also the great dark confusion that resulted from fixed and rigid beliefs. So very painful to admit that my firm faith might have been misplaced. So difficult to accept that the things that I always trusted as being stable and good were in fact fallible and did cause great harm. Not that I already knew all that in that moment, for it takes time and a lot of struggling to see what to outsiders is so obvious. It is dreadful to feel as if all the foundations fall apart, and terrifying to lose all security, and then what? It raises the question if one can ever be sure of anything at all. I have felt such need to figure out what is true and stable, to clarify my confused thoughts that overwhelmed me. Much of my writing is the result of that process. Other texts are more positively inspired by this admonition to consider the lilies: I just want to open my eyes, look without prejudice to things that just exist, and then share my reflections.